Lydia Syson has written three historical novels for young adults and a biography of eighteenth-century fertility specialist James Graham, entitled Doctor of Love: James Graham and his Celestial Bed. 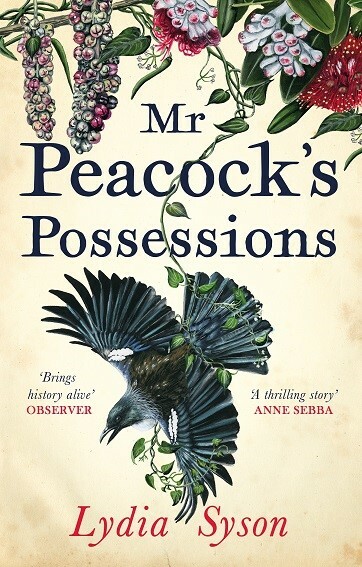 Mr Peacock’s Possessions, her adult fiction debut, is inspired by Tom Bell, her husband’s ancestor who went to live on an uninhabited Pacific island in the nineteenth century. 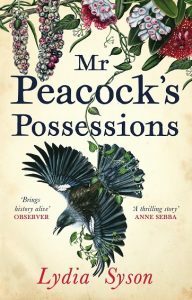 In 1879, Mr Peacock is running a hotel and bar in Samoa, the latest stop on his itinerant family’s journey around Oceania, but it is not the life he has envisaged for himself. When he is offered the chance to sell up his business and buy a small, uninhabited island, he takes it, transplanting his family to Monday Island where they will work long and hard to make it a home. The children, Lizzie, Ada, Queenie, Billy, and Albert, labour as hard as their parents. Their mother is also looking after baby Gussie, and expecting another child. After two years of this struggle, a ship stops at the island and six Pacific Islanders join the Peacocks on Monday Island to help them work the land. The story is narrated by Lizzie Peacock and Kalala, one of the Pacific Islanders. Lizzie, a strong character, believes her father’s every word, never imagining that he might make a mistake. And indeed, Mr Peacock is a clever man but also selfish and self-absorbed. Convinced he is destined for better things, he is happy to leave his Samoan business behind no matter what privations his family might suffer on the island. He is very hard on Albert, a sensitive, sickly boy who does his best to please his father but rarely succeeds. Ada tries to protect her brother but Lizzie thinks he deserves what he gets. Albert always seems to have something wrong with his health but only Ada and his mother show any sympathy to the very lonely and frightened little boy. Kalala and his brother Solomona, two of the work team, who were taught to speak English at a missionary school, are amazed to discover that the Peacock children can neither read nor write. Kalala constantly tries to put into practise the lessons he learned from Mr and Mrs Reverend but sometimes it is not possible. He is fascinated by the Peacock family and keenly observant of their daily interactions. Syson has given Kalala a formal, slightly stilted form of speech that works well with his character, showing that he has been schooled by a nineteenth-century preacher and his wife. Then a child mysteriously goes missing and everything changes. Syson uses the search for the child to describe the island in detail, from the beach to the hills, and it is easy to picture the flora, fauna and pitfalls of their little island. The possessions of Mr Peacock are both physical and psychological. He imposes his will on his family so much that Lizzie and the others cannot imagine he might be wrong. This well-researched study of a family explores what home means to each of them. The Peacocks of Monday Island are vividly depicted and their story is a powerful examination of love and loyalty that lingers long after the last page has been turned.